Aviation and automotive vented fuel caps are designed to keep water out of fuel tanks but they are sometimes not entirely effective. Rainy and windy conditions can lead to water leakage through the vent of an otherwise functioning fuel cap. It is especially important to keep aviation fuel free of water for flight safety. This guide describes a method to make a protective cover for eliminating leaks in vented fuel caps. This method should be universally applicable to essentially any fuel cap shape. I made it at TechShop in San Jose, California (www.techshop.ws). Power on the vacuum former by rotating the red knob clockwise. On the control touch panel, select NEW/EDIT. Open the HEATING ZONES menu and set the heater power to 70% on zones 1 and 2 and leave the remaining zones at 0%. Hit the back arrow to return to the edit menu. Enter the HEATING TIME menu and set the time for 80 seconds (in the time panel hit 8, 0, then enter). Hit the back arrow again. Save the protocol under any number (default is 12) by selecting SAVE and then selecting any number. Wait ~20 minutes for the system to warm up. While waiting for the system to warm up, load the form you want to use to define the shape of your part in the vacuum former. In this case, we formed the sheet over a vented fuel cap. To load the cap, push the lever on the right side of the instrument to raise the grid to the top position. Place the fuel cap in the center of the grid. Now pull the lever back up to lower the grid into the instrument. In order to use less plastic, the opening at the top of the vacuum former can be stopped down with a mask. For this small part, use an 11 ¾” x 11 ¾” grill, or if you have access to a smaller grill that is large enough to fit the part, that will save even more plastic. Place the HIPS sheet on the stopped down grill. Carefully center the plastic sheet to ensure that it will be evenly clamped around the perimeter. Place the top 11 ¾” x 11 ¾” grill into the hinged upper grill support. Lower the grill onto the plastic sheet and squeeze the left and right handles to clamp the assembly together. Run the protocol with the right-hand RUN control on the touch screen. When prompted, roll the heater all the way toward yourself until it reaches the end of its rails, at which point it will be centered over the plastic sheet. The touch screen will change to show the elapsed heating time and offer a button to activate the vacuum. Look between the heater and plastic sheet with a flashlight and watch the plastic as it is heated. First, it will arch upward in the center. Second, it will begin to warp into a wavy surface. Finally, as it uniformly softens, it will sag downward. When the plastic has sagged, which should occur around the 80 second mark for the HIPS material with a 70% heater power setting, push the heater all the way back out of the way. Push the lever on the right side of the instrument downward to raise the grid. Once you see it start to push against the heated plastic from below, push the vacuum control on the touch screen to activate the vacuum. You will see the plastic being pulled down around your form. A few seconds later, as soon as the plastic has been pulled down ½” below the top of the edges of the fuel cap, touch the vacuum control again to shut the vacuum off. If you leave the vacuum on for too long, the plastic will pull in under the cap making it difficult to separate the cap from the plastic. Use the air cooling nozzle near the instrument to blow air across the plastic, cooling it for about 30 seconds until it is just warm to the touch. Unclamp the top grill and carefully raise it away from the plastic. Lift the plastic from the instrument. 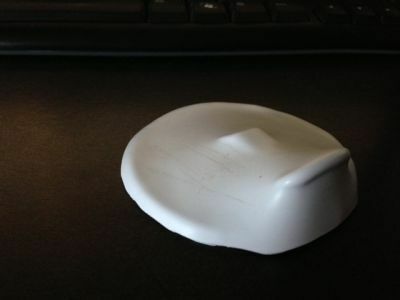 The plastic should be easily removable from the fuel cap. Use a Dremel/rotary tool with a diamond cutting disc to cut out the desired piece of the formed plastic, generally just slightly larger than the fuel cap. Shut down and clean up the vacuum former and you're all done. The part you've made can be placed on top of the fuel cap in your plane so that rain water won't be blown through the vent and into your tank.